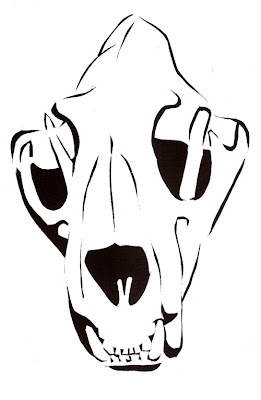 Not to be confused with leopard print skulls, or technical publications about leopard skull morphology, or failed forged CITES permits - this leopard skull stencil came from a transfer at the Atlanta airport. The display case was filled with an array of seized items, including this leopard skull. Kind of creepy for an airport exhibit but it caught my eye. One minute a predator in the wild and another minute yet another thing passed on the way from one airplane to another. A silent observer of masses of humanity on their way other places. A visible reminder, a deterrent, a lesson but I'm not sure for who.